Once or twice a year, my Dad likes to travel to a casino a little over an hour away from us and play the slots. A couple years ago, since I’d never tried it, he convinced me to go with him. Yesterday was my third trip, and there were 8 of us who all car-pooled there together. It’s a lot of fun. I haven’t really won any money at it yet, but neither have I lost much, and it’s a neat way to spend some extra time with my parents (who are awesome). Last fall when we went, I found this cool slot machine with panthers, jaguars, jewels, and these two guys with claw marks on their faces who I assume are were-cats of some sort. Cats? Yes, please! I had fun with it, and it sparked some ideas for a scene or two in my next novel. So when we went back to the casino yesterday, I soon found it and played happily, swimming in imagery. I joked about being at the casino to “do research,” but I really did pay particular attention to the sights, sounds, and smells of the place. I let myself daydream as I played “my” machine, story ideas rolling around in my mind. When I got back, I wrote down a couple pages of notes. The casino scenes are part of a sub-plot of the novel as a whole, which is still taking shape gradually. It’s kind of a paranormal mystery or thriller, which is quite different for me. It was sparked by a suggestion my brother made, so I’m thankful to multiple family members for the inspiration! 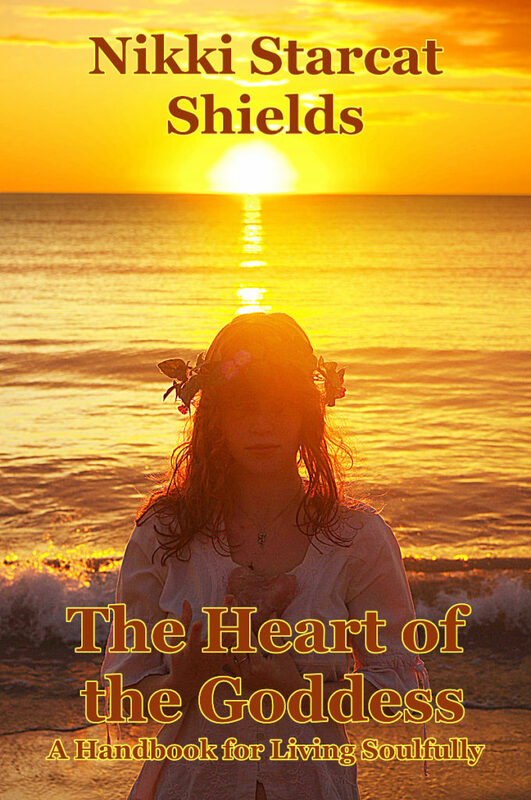 It will probably be my NaNo work this fall, unless I can’t help but start writing it sooner. All of this really just serves to flesh out this post, as I don’t have much to report since Sunday. Blogging is on track. Yoga is still rockin’ my world. I took a look at the outline for my next work of non-fiction, but I haven’t done anything much with it yet other than make a few notes on revisions and additions. I hope you’re combining work with play like I am, and having a really fun week! This past week I was in between any significant work on my major writing projects. Revisions on The Door Is the Key are paused, at least for me, as I wait for my co-author BlackLion to finish his first read-through and commenting. He’s been busy with other projects, but will be putting his focus on it this coming week. Since I hadn’t yet chosen my new writing project, we sent out a survey to our readers to see what they’d most like to read about next. 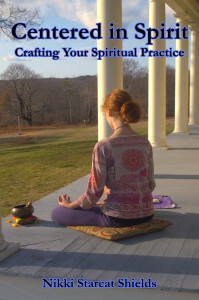 From a list of five choices, the highest-rated one is “creating and maintaining a daily spiritual practice.” Hmm. This is one that I’d started already and set aside, in part because I wasn’t sure if it would be of interest. I guess it is! So, this week I want to revisit my original outline, read over what I’d written so far, and then go from there. I’ve stayed pretty organized in terms of my new planning system, and I’ve been checking off smaller projects on my list while I’m in between bigger ones. 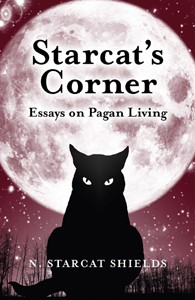 I wrote another book review for a fellow author, set up a profile for my books on a Pagan networking website, wrote and submitted a guest blog and an article, and started a new resource page for my fellow writers (here on this site – click on Resources for Writers up there at the top of the page to check it out). Blogging is going well. It’s easier to keep up with posting now that I have a schedule, and I’ve been getting great responses. Guest blogging is on track, too. I’m currently reading Blog to Win Business: How to Enchant Readers and Woo Customers by Henneke Duistermaat, and it has a lot of useful tips on how to write posts that will interest your readers. My wellness practices are going great, especially yoga and meditation. I’ve been starting my day with it, and it really helps me feel calm and centered. I’m also starting to notice physical changes as I become more flexible once again. I’ve been eating better, and have lost 5 pounds so far – I now have about 30 more to go to reach my ideal weight. This week will be a busy one, with lots of family social time, so I’m not sure how much work I’ll get done on the new book. But this in-between time is pleasant and I know it won’t last forever. I’ll relax into the process and see what I can accomplish. Have a wonderful week! So, I had a pretty boring update to write here today, since I’ve mostly been working my outside-the-home job since Sunday’s update. Sure, I did a few goal-related things: I’ve been keeping up with blogging, I finished reading a fellow author’s book and writing a review for it, and my morning yoga practice has been going great. He loved it, and encouraged me to post one of them to Facebook right away, so he could send it to George Takei. So maybe, just maybe, I’ve created a new web sensation for my fellow bookworms. Speaking of which, fellow book lovers (ahem, that’s you! 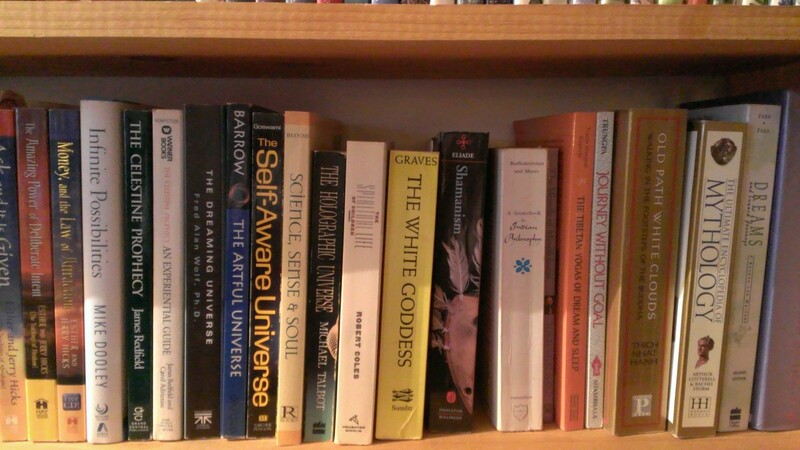 ), how about posting a shelfie or two of your favorite books? I’d love to see what books you love enough that they take up space on your bookshelves. Leave a comment here or on Facebook, and let’s share books! It’s Sunday, and thus time to check in on progress towards my goals this week. Happy holiday to those of you celebrating today! We attended a family potluck this afternoon with lots of laughter and delicious food. I’m blessed with a terrific family, including of course the sweet four-legged members. I’m well contented with my progress this week. I’ve finished my first read-through of our NaNo novel, making comments for our revision work. I feel like it’s a good story, and will be even better with some tweaking. I had fun reading it, which is a good sign, right? BlackLion is still working on his read-through. 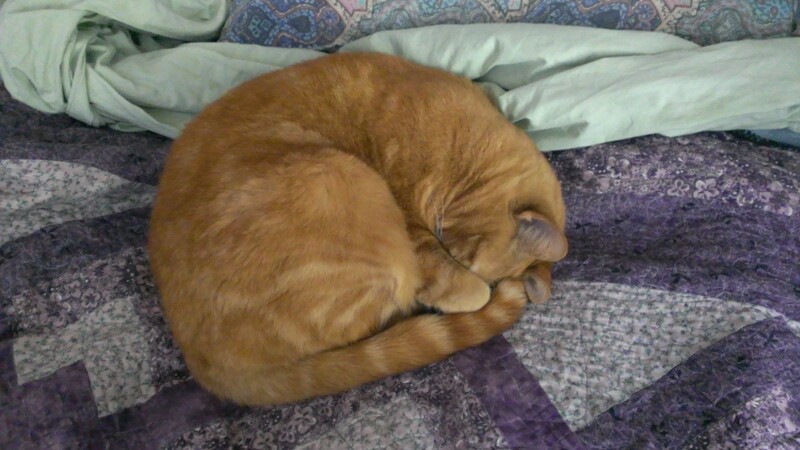 Happy to report that I’m still up to date on blogging, and have been getting more interest and positive feedback on both my Feline Dreamers and Starcat’s Corner blog posts. I’m thinking and hoping that one of these days, a post will “go viral.” I’m ready! We’re releasing a brief survey tonight, to ask our readers what they’d like to read next in our Inspired Living series of e-books (the first one was Cultivating Self-Love: Your Path to Wholeness). We listed 5 choices of topics, ones we’d come up with when we did our planning for 2014, and then gave them an “other” box in which to add ideas of their own. Once we’ve gathered the results, I’ll start outlining the next e-book. I’m excited to immerse myself in a new writing project! In the meantime, I have a bunch of loose ends and little projects I want to work on this week. I should have some time to devote to my desk-decluttering project. I need to finish reading a couple of books so I can write reviews of them. 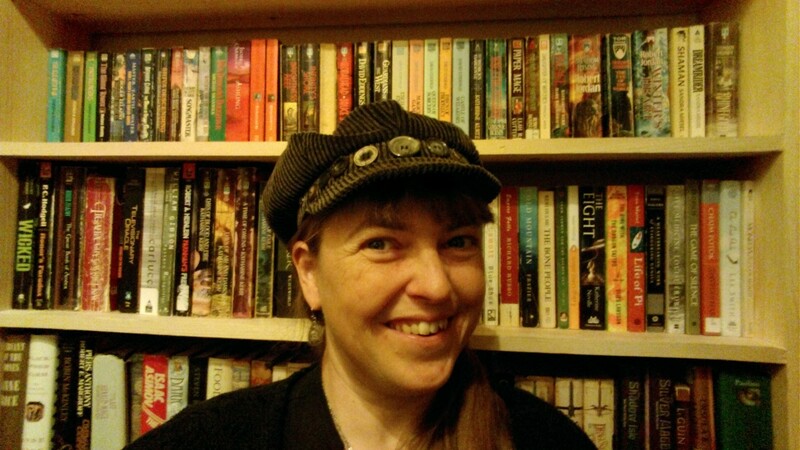 I promised a couple of author friends that I’d share some of the writing and marketing resources I’ve been learning about, so I’m planning to start a page for that on this blog. Various other odds and ends will hopefully be checked off my list, and I have some work shifts at the radio station as well. Next week I’ll start in earnest on the new e-book, and hopefully BlackLion and I will begin the next stage of our revisions by beginning of May. That’s all the news I have at the moment. Have a fun week, and enjoy those leftover chocolates and jelly beans! This week is going well. I’m getting into the groove of my new morning practice of yoga and meditation, and the energy from that practice flows right into my writing and editing sessions. I like having a loose schedule for the day. It forms a useful container for my creativity, and gets me moving, yet it’s flexible enough to suit my changing needs. As of today I’m on page 182 of 213 of my read-through and commenting on our novel, The Door is the Key. One more session and I should be done. Woo hoo! Then I’ll move on to outlining my next book, while BlackLion finishes his read-through. After that we’ll dive into the next phase of the revisions. Blogging for the week is on track, which feels good. Marketing and promotion continues to go well. I have a book I’m reading to review for a fellow author, and after I get done with that one, I’ll pick up my next “craft” book. There’s one on blogging that I want to read next. I still want to add more body movement in the evenings. I haven’t been doing my dancing practice consistently, and I figure it could be a good break from more sedentary evening pursuits. Gotta fire up that Pandora shuffle and go for it! I guess I had to get my yoga practice established first. One step at a time! De-clutter my desk, bookshelves, and filing cabinets. 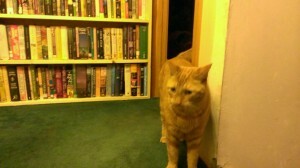 This includes Quester’s creation of a new bookshelf in the upstairs hallway. Make the space more user-friendly so I’m more likely to use it. 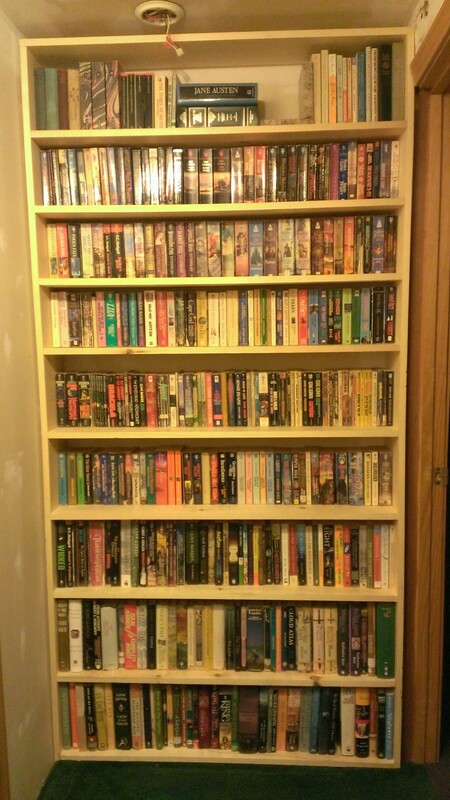 Quester built an awesome new customized pine bookshelf, floor to ceiling, in the upstairs hallway, making that area a new little library nook. 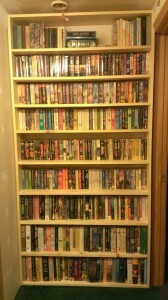 This also lifts the total number of bookshelves in our home to 12. Heh heh. Here’s a picture. Note that we have yet to finish painting that whole area and doing some trim work. Yeah, maybe a bit backwards, but I needed the shelf space! 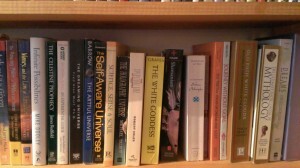 I’ve been categorizing as I go, rearranging a bunch of shelves. This new library nook is ALL fiction. It’s accompanied by a smaller shelf, now moved to the other side of the bathroom door, that used to be where the new one was. That one all young-adult fiction. I couldn’t get a good picture of it, though, because of the glare from the spotlight-style lights. 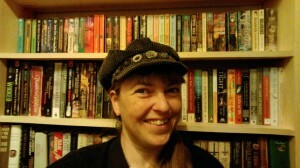 See, I’m happy as a bookworm in a new section of her home library! 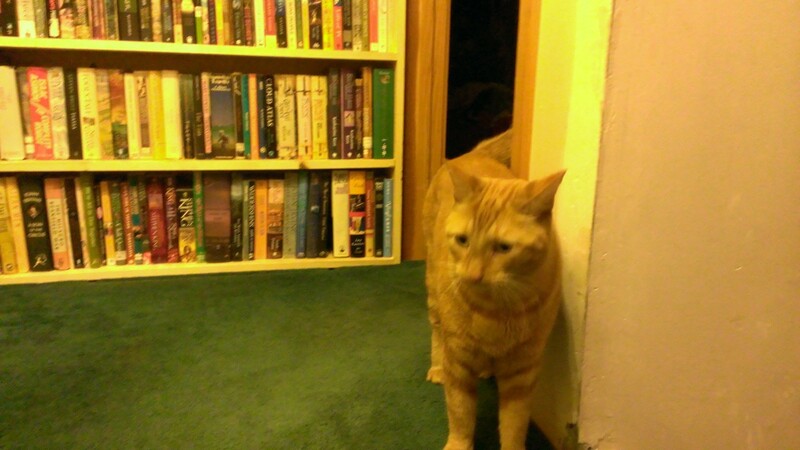 And, furthermore, the new book nook is cat-approved, by Sir Percy. I’m still in the process of categorizing a couple of other major bookshelves, including the one in my room that helped precipitate the whole project. More to come on that this week. Oh, and I weeded out some books we don’t need, duplicates and ones we didn’t feel we wanted to keep, so they’re on their way to the thrift shop to be shared with other readers. What else have I been up to? Well, I’m now on page 155 of 213 on my read-through and note-taking for our novel. With this post, I’m up to date with blogging for the week (for the first time in forever). Yay! 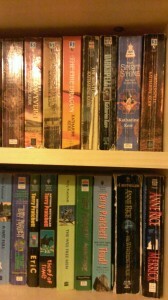 And I submitted a guest post to the Moon Books blog for this month. 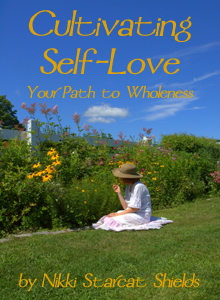 I started looking into CreateSpace for getting hard copies of Cultivating Self Love; I had another reader request for it this week, which gave me the motivation. My wellness practices are going along swimmingly. I did yoga several times, along with my other practices. Drum practice is going well, and during today’s rehearsal I got a couple new things to be working on. I had quite a bit of outdoor time this week, it being sunny and warmer. It feels so good, and lifts my spirits and energy level. Quite a good week, I’d say! I’m off to a good start with this round. I wonder if that’s the case for a lot of folks, as we have the awakening, refreshing energies of spring on our side this time. Anyway, I took some time to get organized, as I talked about in my goals post. 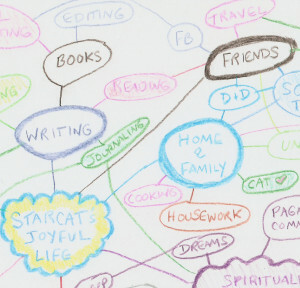 I didn’t know where to start, so I sat down with paper and colored pencils and made a mind map about all the various priorities in my life (pictured here is a portion of it). That helped me prioritize and see the connections between the things I choose to devote time to, and put everything in perspective. I went on to come up with a writing calendar on Google Drive (with some help from BlackLion). We have a marketing calendar for Feline Dreamers, and we created something similar, only this one is for all my writing projects. This will help me stay on track with my blogs (there are 3: this one for writing-related stuff, my Starcat’s Corner blog, and my contributions to our Feline Dreamers website and e-newsletter), plus guest blog articles, other projects with and without deadlines, and revisions for our novel. Believe it or not, it was fun creating it. I also now have a document to plan out topics for each blog post. I’d say I’m about 25 percent done with filling in the topics for this month – a good start – and I’m on track for reaching my posting goals for this week. From there, I came up with a loose schedule for the days when I’m working from home. Basically, get up and ready for the day, then do my morning practices (which include yoga, meditation, and journaling). Have breakfast, usually a smoothie, then get to work on the day’s writing and revising. Take a break for lunch and some exercise, getting outdoors if possible. Then work on other projects in the afternoon, including stuff with the kids and housework as well as correspondence, etc. In the evening, along with family dinner and social time, work in my dance and drum practice, as well as reading. The schedule will change when I have other commitments, but this is a loose outline that I can work with. Today I did some work on the revisions for the novel. I’ve now done 135 pages out of 213 total for my first read-through and note-making. I also wrote blog posts and newsletter content, and worked with a friend to set up a homeschool workshop that we’re collaborating on. My wellness practices are going fine. This morning I did yoga, and we took a walk with the dogs this afternoon. It’s only been one day, really, with the new system, but I think it’s going to help. Of course, tomorrow is our homeschool co-op, so the schedule will get put on hold for most of the day. That’s okay, though. That’s why it’s a flexible schedule! I’ve been thinking about the first ROW 80 round and the things I didn’t accomplish. I’m not beating myself up about it, just reflecting on the things that didn’t happen and pondering the causes. 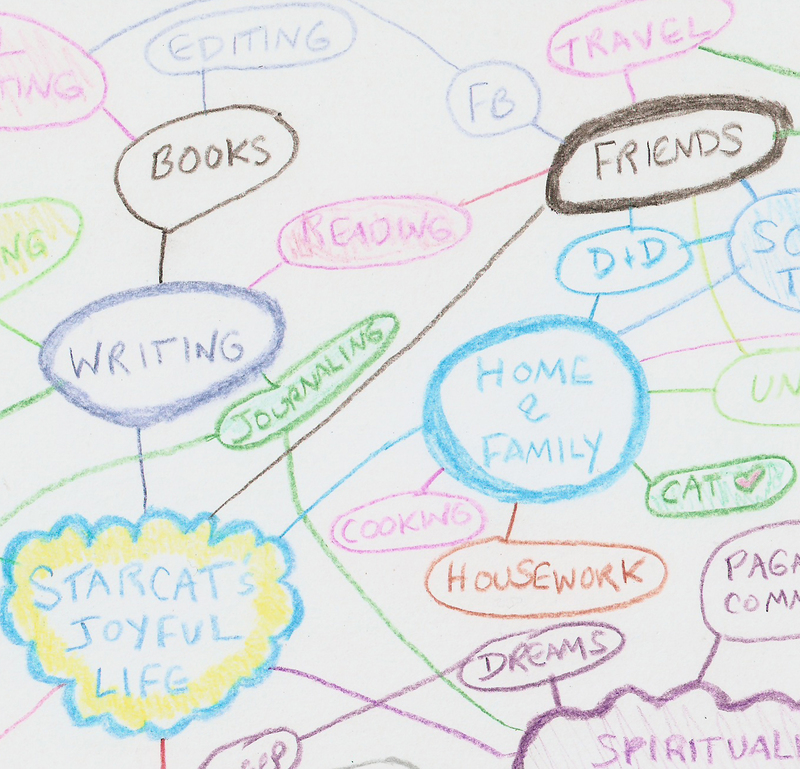 What’s missing, I believe, is a system for organizing my creative work. My Word of the Year for 2014 is ENJOY. I’ve been learning to go with the flow in my life and focus more on being in the moment. So you wouldn’t think I’d be looking for another layer of planning. But I am. Why? Because the way things are now, my true creative priorities seem to get shuffled aside regularly. Not cool. Currently I keep a small notebook with a page for each day, which includes the things I have to do outside the house (like kid sports practices, my part-time work at the radio station, and social gatherings), reminders about my wellness practices, and a list of things I want to accomplish that day (including chores and errands as well as creative tasks). As part of going with the flow, things that don’t get done are simply forwarded to the next day. The challenge is that things that don’t have particular deadlines, like my personal creative projects, get endlessly forwarded on. The things that get done first are appointments with a time attached to them and tasks that stare me in the face, like a pile of laundry or a sink full of dishes. Yes, those things are important, but they shouldn’t be of higher priority than my personal creativity and spirituality. So this round I’m going to try something new, setting aside regular time for my writing work and wellness practices. I know myself and my tendency to rebel at strict schedules, so that’s not my approach. Instead I’m going to create a flexible outline, customized for each week, that will hopefully help me focus. It will encourage both fun and productivity. This week is a good time to start, as I have a bit of a lull in my part-time work outside the home and can get going on this new plan. Wish me luck! Create and implement a loose daily and weekly schedule for my writing work and wellness practices. Look over the plan at the beginning of each week and adjust it based on other commitments on my calendar. Make weekly and/or monthly outlines for all my blog posts, with both content and posting schedule. Write and schedule posts ahead of time when possible. Include ideas for pictures and images. In collaboration with BlackLion, edit, revise and polish our NaNoWriMo novel,The Door Is the Key. Have it ready for beta readers by the end of the Round. Write and edit at least three guest blog posts and have them posted. Choose my next book project and outline it. If it’s fiction, read Rock Your Plot and begin plotting. Get more time outdoors on a regular basis.